In this exercise I am to imagine I have been asked to advise on the refurbishment of a country house – a building of any period. While I usually try for an Australian twist I don’t think Australia has quite the same tradition of country houses as Britain. We have farmhouses and beach shacks, but not so many grand country homes. So this time I have chosen an English theme – a new ending to Jane Austen’s Mansfield Park, so around 1806 – 1810. In this version Henry Crawford has proved constant and won the hand of Fanny Price. Crawford has decided that Everingham, his Norfolk estate, is too far from his new connections (including his sister Mary and her new husband Edward), and has taken Laxton Hall in Northamptonshire as his new home with Fanny. Naturally as a confirmed improver Crawford wants to make his own mark, and has engaged me to advise on a substantial enlargement of the house and landscaping of the grounds. (Modern note: as it happens Laxton Hall did undergo major work in the early 1800s, so I have some solid information to guide me). Henry Crawford is a modern young man who is keenly interested in improving the property. He has previous experience, with minor improvements to Everingham soon after coming of age, and advising his brother-in-law, Mr Rushworth, on the landscape improvement of Sotherton. Mr Crawford has grand plans and wants all elements of the new design to be in the best of modern taste. I have some fears that he may be subject to sudden changes of opinion and not willing to submit to sober judgement, so may be a challenging client. His ambitions may also be beyond his wealth, reputed at 4,000 pounds per annum – although he has expectations from his uncle the Admiral. The expanded house and its new landscape should be among the best of the best of gentlemen’s country seats. Taste and wealth should be apparent in every room and every vista. Music room: Mr Crawford is very fond of music. His sister is a talented exponent of the harp. 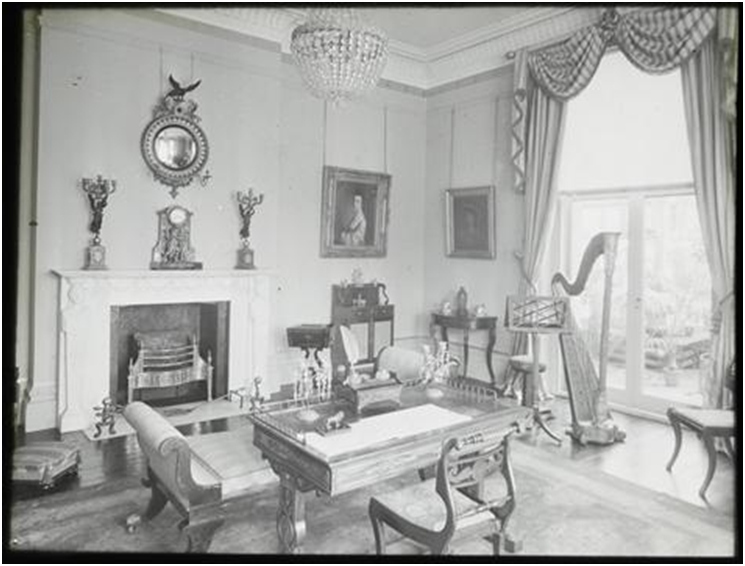 Mr Crawford has spoken fondly of the room used for his sister’s harp in Mr Grant’s parsonage, which includes a tall window giving out to a grassed area where young ladies may stroll. Library: Mr Crawford’s young bride is a keen reader. Mr Crawford reads aloud extremely well, and while not familiar with classic texts has a natural good taste and judgement in literature. An inviting and commodious library is important to the new household. Theatre: There is some ambiguity in this requirement. It is both desired, and yet not to be spoken of. I see discretion is required to provide for “spontaneous” private dramatics without actually planning to include a theatre. The existing hall is early 18th century, is three stories plus basement and faces south. The oval entrance hall is flanked by two smaller rooms. The main rooms are in wings on either side. The first alteration plans were drawn up by Repton. These extended the house to the north, and moved the main entry to the house to that side. However they did not provide the music room and large library deemed necessary by Mr Crawford. There was also a suite of small rooms to the north west (lower left on the plan) which were felt not to provide the grandeur desired. Further drawings were developed by William Carter and George Dance. 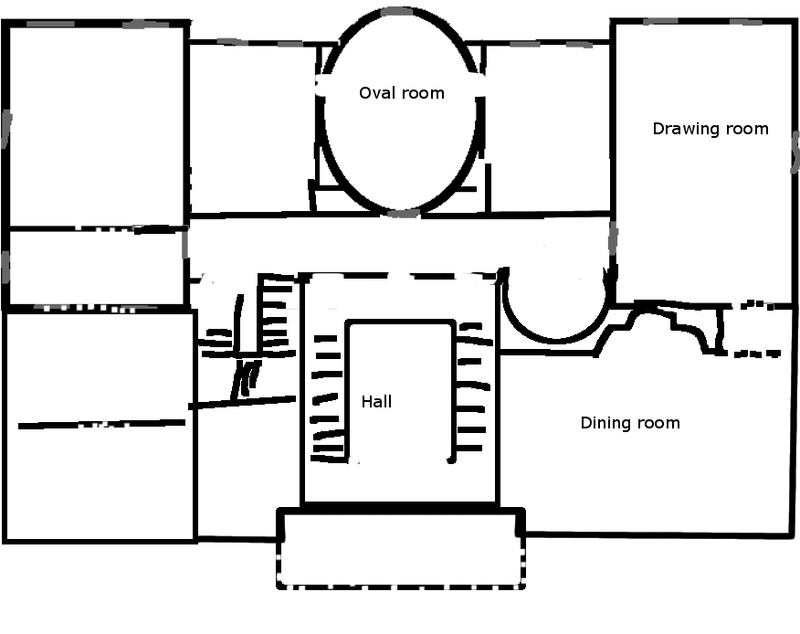 The oval and two flanking rooms were thrown together to form a large library. This was further improved by connection to an external terrace and stairs leading out to the park. A music room was provided. The new north entry was made much more imposing with the addition of a porte cochère and an entry hall with a magnificent circular lantern. 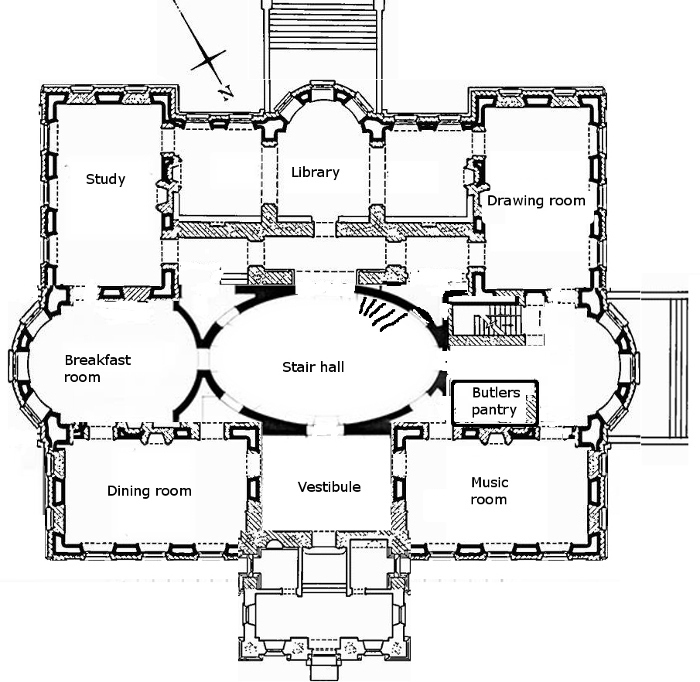 The major defect of these plans was the relocation of the main stairs to an awkward side location below the library. 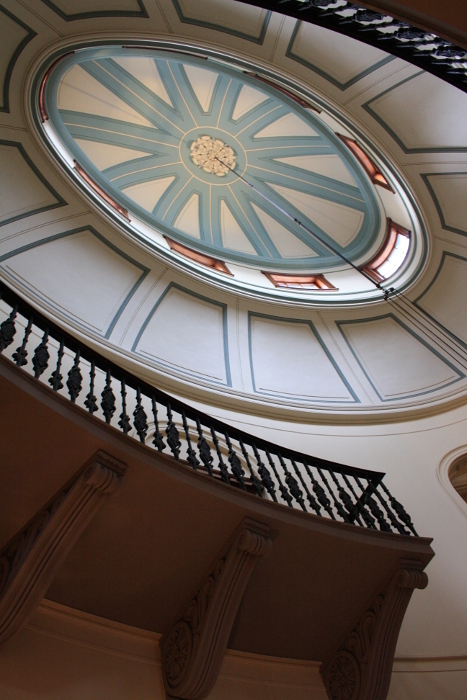 My revised plans further enlarge the house to include a stunning central oval stair hall. This brings light and importance to the centre of the house, and provides access to all the major rooms. The north west door leads to a barrel-ceiling passage and to a side room which connects drawing room, music room, and a small terrace to the exterior. A new oval eastern room provides an elegant breakfast chamber. 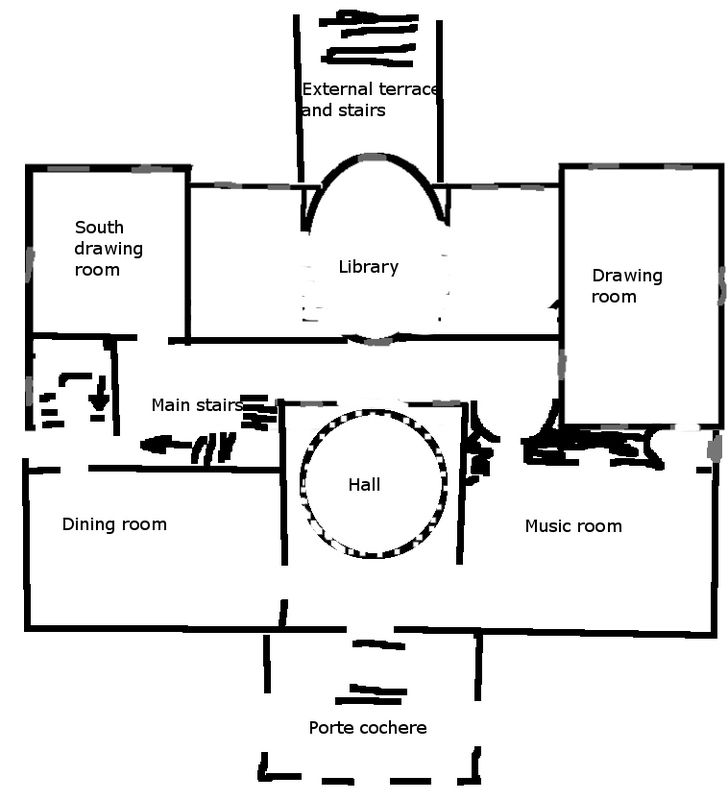 A study for Mr Crawford has been included, with a direct connection the large library first suggested by Carter. Although not indicated on the plans, the library combined with Mr Crawford’s room would provide ample accommodation for a private theatrics. The house will be appointed in the modern neo-classical style, with particular emphasis on the new eclectic elegance in design introduced by Mr Thomas Hope in his recent volume Household furniture and interior decoration based on his collection of antiquities. 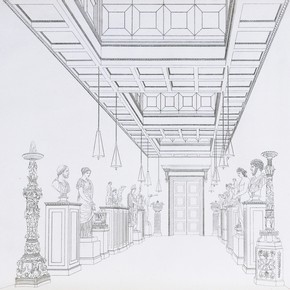 ‘The Statue Gallery’, Plate 1, ‘Household Furniture & Interior Decoration’, by Thomas Hope, London, 1807. 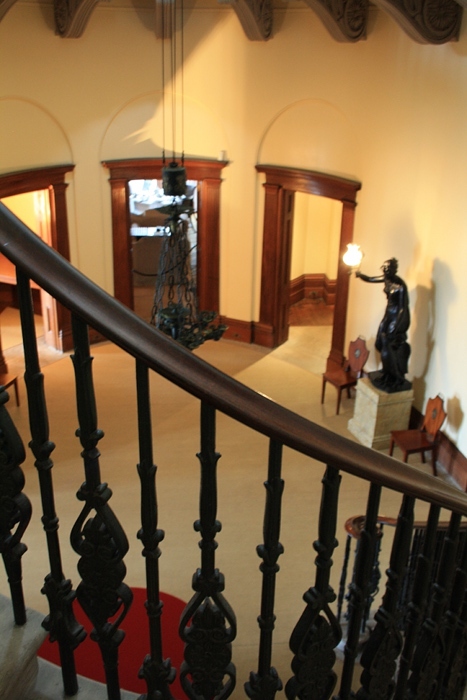 The Stair Hall will become a Statue Gallery, with a series of busts on plinths alternating with elaborate lamps. Combined with the windows of the dome, this will light and lend a feeling of refinement to the core of the home. 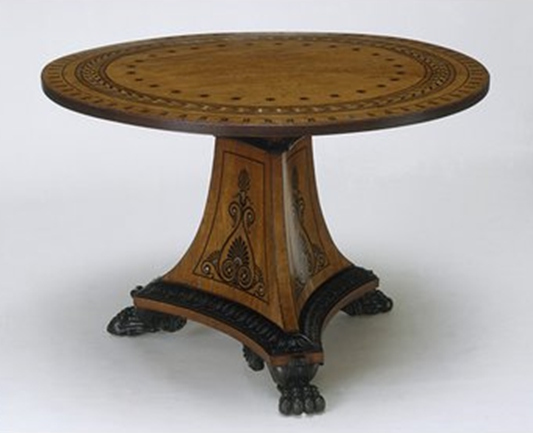 I will further advise Mr Crawford to commission a table from Mr Hope for the centre of the Hall. This should be resized to an oval form to complement the overall space. The Music Room is an area dear to Mr Crawford’s heart. His sister is an accomplished player of the harp and he wishes to have a suitable instrument available for Mrs Edmund Bertram whenever she should visit Laxton Hall. Early in his acquaintance with his young bride, Mr Crawford spent happy hours in her company, listening to the music of the harp and watching the two young ladies outlined in the light of the tall windows, the inviting green of the turf just outside. This arrangement should be replicated in Laxton Hall. Paintings in the room should enhance the sense of intelligent, elegant people enjoying the pleasures of music together. 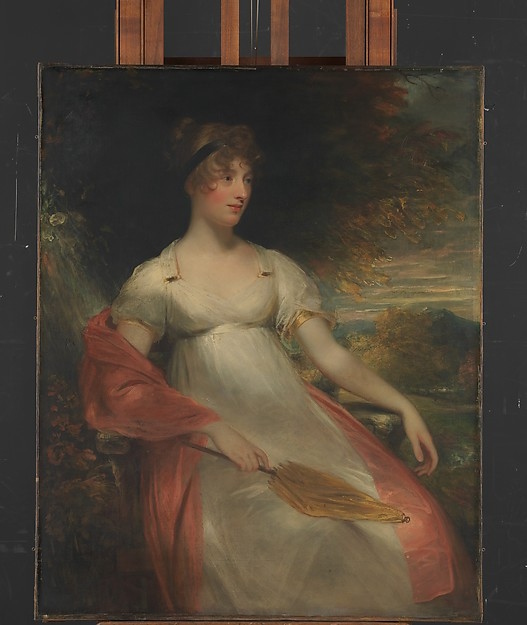 Mr Crawford may chose to commission a portrait of his bride from Sir William Beechey. Other works could celebrate the cultivated arts of England – music, art, poetry, dance, genteel persons in conversation or at leisure. 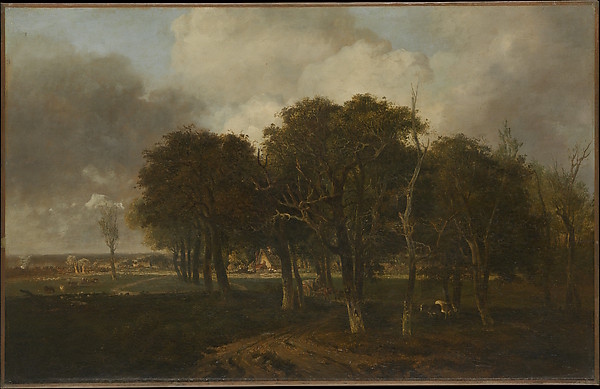 Paintings and etchings of places of meaning to the family could also be included, for example showing scenes from around Mr Crawford’s boyhood home in Norfolk. I propose that the library should provide a more masculine and energetic environment. A maritime theme would provide a delicate compliment to Mr Crawford’s uncle, the Admiral. It would also celebrate recent English naval successes, and the maritime links of Mrs Crawford’s brother and father. 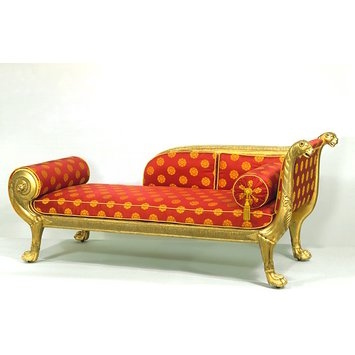 The theme could be carried through into the furnishings. 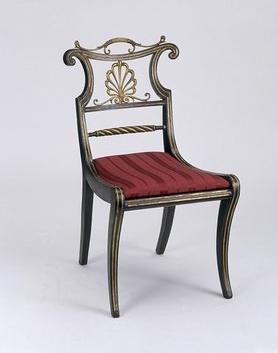 The rope-twist back rail on this chair provides a subtle naval reference. Regardless of the more masculine environment, all the family will use the library and it is important to provide comfort and variety in seating. A pair of couches, mirror image, could face each other either side of the fireplace with high side to the wall to create an attractive setting. The house is well placed in a high position, with the land falling to the south east. The existing waterway below the house should be modified to create a lake. Turf over the slope leading to the new lake will open the prospect to view from the house. The ladies of the household will spend considerable time in the music and drawing rooms, and the house plan provides easy access from there to the gardens. Planting on this side of the house should invite the ladies and provide variety in their daily exercise. The turfed area outside the music room should give onto a rose garden, including shade trees and benches for seating. Beyond the flower garden should be a “wilderness”, with shady trees and gravel paths. Benches should be provided at intervals, particularly where the fall of land and openings between trees allow a view towards the lake. The lie of the land to the south west of the Hall provides an area which can be used for additional buildings such as the stables, without impinging on the main views from the house. On this side a walled kitchen garden should be provided. The approach to the house is from the north. There is an existing oak avenue. Although not entirely in the modern style, the ancient trees are of great value to the new lady of the house, and should be retained. A combination of further planting and a partial rerouting of the road will provide a more pleasing approach, with a series of glimpses of the house and lake beyond from different angles. This exercise requires an illustrated account of a visit to a public interior. The interior should ideally be of some splendour or intricacy, and should be considered in terms of its historical interest, its setting for a particular purpose, and the interactions between the architecture and the works on view. I selected the ANZAC Memorial in Sydney as my focus. When visiting and researching the main interior I found I had to broaden the scope to some extent – the interior and the memorial are a whole. The main interior is a single space. The Hall of Memory is approached from external flights of stairs. Upon entering one is immersed. Above is the Dome of Stars. Below, one looks down into the Well of Contemplation to the Hall of Silence, and in the centre The Sacrifice. The concept of a War Memorial was first raised and fundraising begun on 25 April 1916 – the first anniversary of the first major military action fought by Australian and New Zealand troops in the conflict we now call the First World War. After the War discussion and fundraising continued. 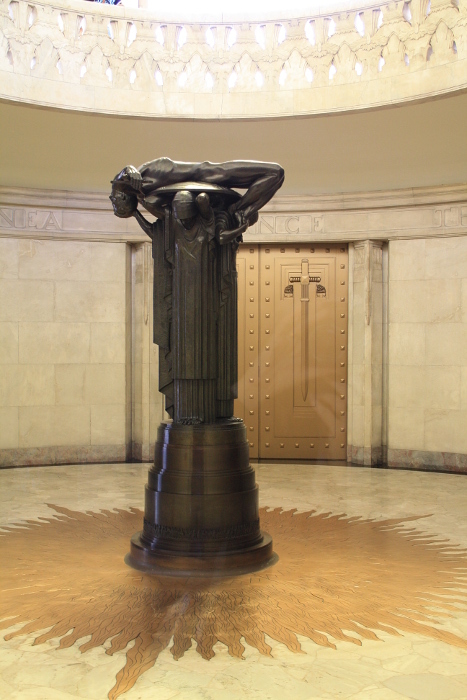 In 1923 the ANZAC Memorial Building Act was passed in NSW. A design competition was held, and in 1930 first prize was awarded to architect C. Bruce Dellit. Foundation stones were laid in 1932, the dome was completed in 1933, and the building officially opened in 1934. One date that is not known is the first involvement of sculptor George Rayner Hoff who collaborated closely with Dellit in the construction of the memorial. The main space of the Memorial is a frozen moment in history. In 1995 a Flame of Remembrance and flags were installed in the Hall of Memory. 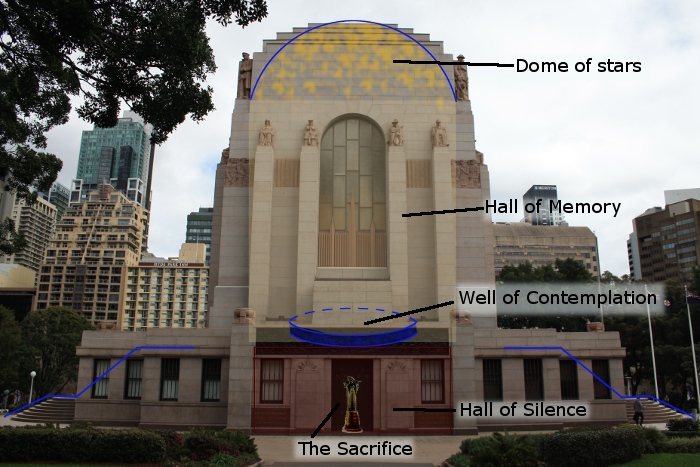 In 1984 the ANZAC War Memorial was re-named the ANZAC Memorial, and re-dedicated “to honour the men and women of NSW who served in all wars where Australia had been involved”, but this left no physical trace on the space. All the modern necessities – railings, safety glass, lift – are discreet. The Memorial is preserved for future generations. Dellit worked closely with the sculptor Rayner Hoff, who was responsible for the internal and external statuary as well as many fixtures and details of design. The strongest example of the tight linking, the sympathetic cross-pollination, of their work was the placement of The Sacrifice and the nature of that work. The general layout is based on the tomb of Napoleon in the crypt under the dome of the Eglise du Dome Church at the Hotel des Invalides. An opening in the floor of the church allows visitors to look down at the sarcophagus – bowing their heads to Napoleon. Dellit’s central design is a stripped down, condensed, modernised version of this. It is an elegant, understated means to encourage a sense of quiet contemplation and remembrance in visitors, a physical and mental recognition of the sacrifices that were made. Dellit’s proposal for the statue was “a hero, noble and glorious in the Greek manner expiring after having killed a colossal bird of prey … a sorrowing woman nursing tenderly yet firmly an infant in the folds of her right arm, and in her left hand … the branch of one of our Australian gum trees” (Dellit, quoted in Edwards, 1999, p. 77). Hoff distilled this to focus on the sacrifice of the virile young man, the women who loved him, and the nation as a whole. There was considerable controversy surrounding the decision on the purpose of the Memorial. Many, including members of the ANZAC Fellowship of Women, wanted the Memorial to be “a sacred centre”, commemorating the human sacrifice made for future generations. Led by Dr Mary Booth, who had run the Centre for Soldiers’ Wives and Mothers during the war, the Fellowship had been major fundraisers for the building and were vocal in insisting “their opinions should be respected”. The Returned Soldiers Association urged “a lasting memorial, some outstanding legacy that shall quicken the blood of future generations, and move them to bare their heads in honoured memory of those who won for Australia its place amongst the nations”, while also providing premises for services to returned veterans. The end result was “a wonderful compromise: a building that would be six-sevenths ‘symbolic and aesthetic’ and one seventh ‘practical’ (Spate, 1999, p. 54), used by associations for returned veterans including groups for Limbless Soldiers and those with TB. These groups were accommodated on the ground level, in a series of rooms surrounding the Hall of Silence. The memorial has as unusual focus on women, given its time. In The Sacrifice the dead soldier is bourne by his mother, sister, and wife – who also carries their child. The sacrifice of the women is commemorated. Bearing the fallen on their shield has strong classical allusions. 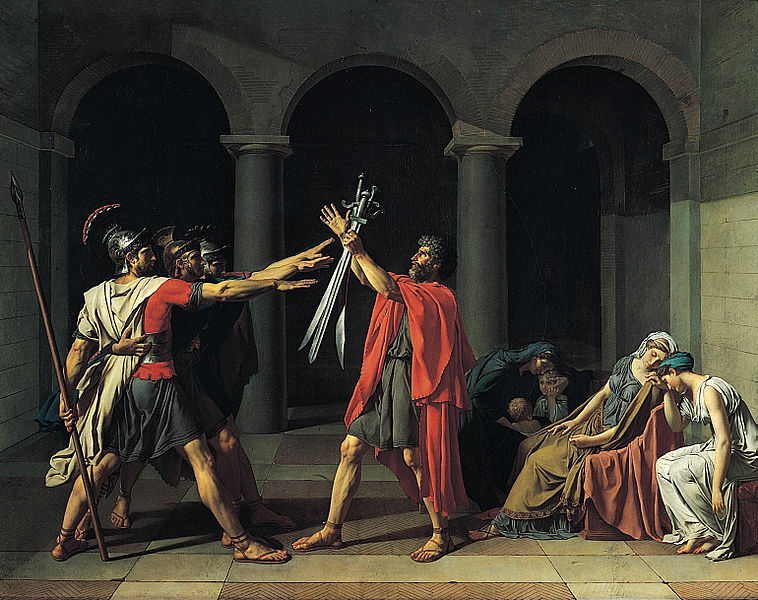 One stong link is to David’s The Oath of the Horatii. In that painting the women already mourn as their menfolk go to war. The statue portrays a later episode in that often repeated story. The elongated figures in their formal folds of drapery also suggest the figures seen outside Chartres cathedral, adding to the “secular cathedral” impression of the structure. The inclusion of women goes beyond fundraising for the Memorial and even bearing their dead in their final sacrifice. Women are included as active participants in the theatre of war. In the Hall of Memory, just below the Dome, are four shallow marble reliefs. In each there is a central figure flanked by two more, slumped in fatigue, mourning, or perhaps grievously wounded. Behind is a line of crosses, and at the back the March of the Dead – those who were called from life on service. In the example shown above we have a female nurse as the central figure, and just possibly the seated figure at the right, and more remarkably there are naked women included in the March of the Dead. Women and their final sacrifice are honoured and memorialised. I believe this is very unusual for a “Great War” memorial, and a tribute to convictions and vision of both Dellit and Hoff. However on two more proposed sculptures it was the naked female figures which prevented completion of the Memorial as intended. 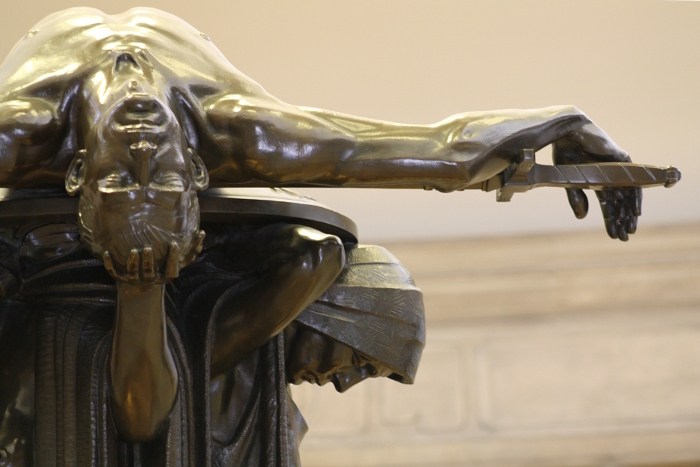 Two more large bronze sculptures were proposed – Victory after Sacrifice, 1918 and The Crucifixion of Civilization, 1914. Both included as central focus a naked female form. Models were created, but the designs attracted strong criticism from church leaders, and the bronzes were abandoned. 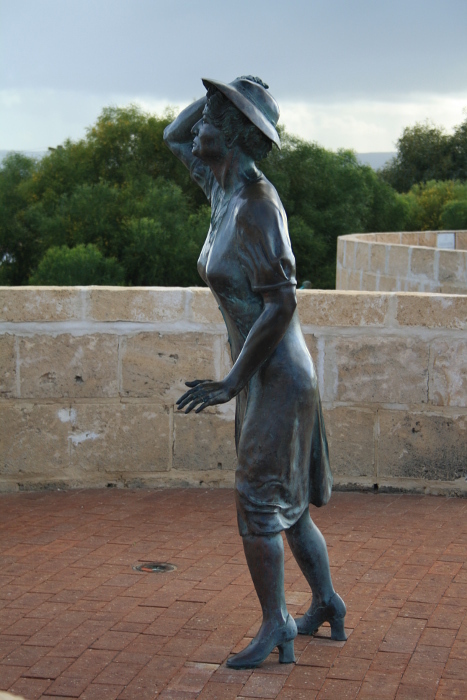 Personally I found the inclusion of so many female figures in the Memorial gave a sense of completeness and also of a broader understanding of the widespread impact of the conflict. This is a Memorial not only to individuals, but to a community. This is a much more inclusive vision than the general ANZAC myth, one of the underlying symbols of identity of Australia as a nation – and one that is generally male. Writing about the Memorial Edwards explained “During the war, the Prime Minister William Hughes, claimed that the Anzac, ‘coming from a land without history’, had through this soldier’s actions, attained for Australia a real and independent nationhood, as opposed to the false nationhood of Federation” (Edwards, 1999, p. 71). I wrote about “the bravery, mateship, determination, skill and intelligence of the Australian troops in action in WWI” in my post of 31-Dec-2013 in reference to the Cenotaph in Martin Place. 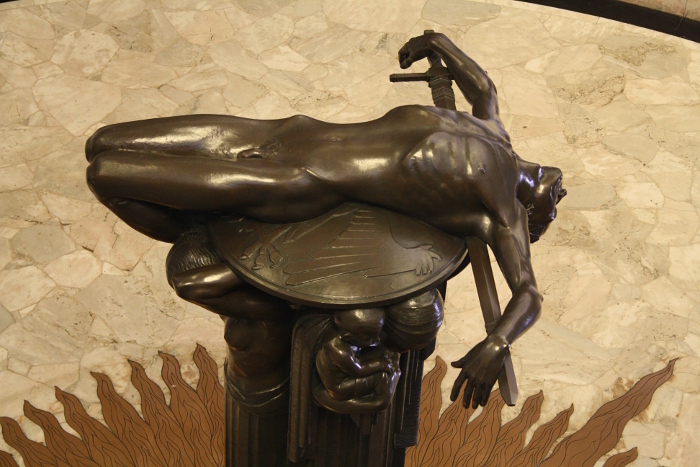 In the ANZAC Memorial the strident male vigour seems more muted. In an earlier exercise on figure sculptures (see 13-June-2014) I included this slightly earlier work by Hoff, in which he celebrates a female form of Australian identity. While researching for this current post I learnt that Hoff worked from models rather than synthesizing an “ideal” form. 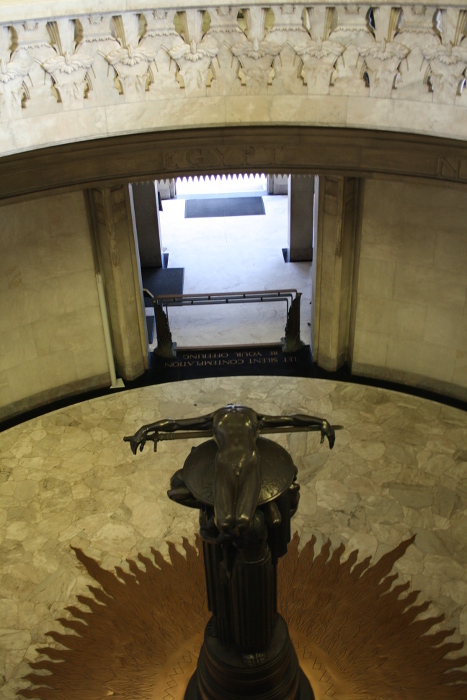 Hoff was an advocate of Vitalism, and believed in a life energy and a male-female unity, and this could underlie the strong female element in the ANZAC memorial. Although I have focused on the interior, as required for this exercise, this space is in a specific and meaningful place. The building is in Hyde Park, close to the centre of the city. Approaching it through the park one walks past the Pool of Reflection, between rows of trees linked to the Lone Pine of Gallipoli. Already a sense of withdrawal from busy life, of contemplation and reflection, is growing. A series of statues on the exterior of the building look down on visitors. These aren’t like the arrogant explorers I noted surveying their territory on the Lands Department building (see 13-Apr-2014). Rather than glorying in battle, they sit or slump, weary, perhaps wounded, pensively looking down at the generations they fought for. The importance of the Memorial is shown by its placement within Hyde Park. A number of other locations were considered, but this places the building in the heart of Sydney, and as can be seen from the Park map it dictates the entire layout of the southern end of the Park. In the northern end of the Park is the Archibald Fountain (mentioned 13-June-2014), with a direct path between the two installations. 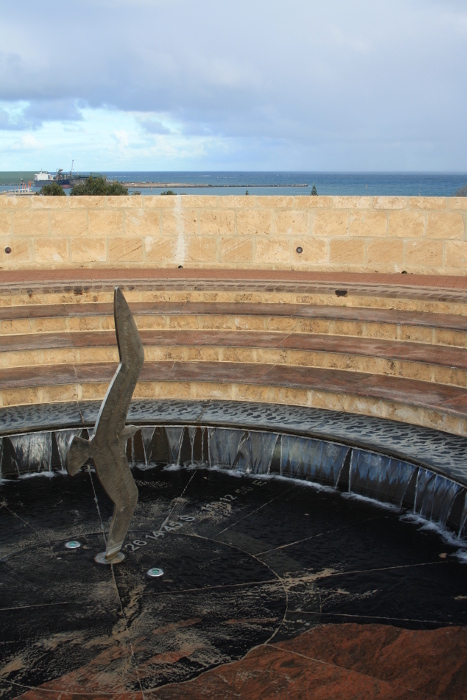 The fountain is by sculptor François-Léon Sicard and it was unveiled in Sydney in 1932, during the building of the Memorial. 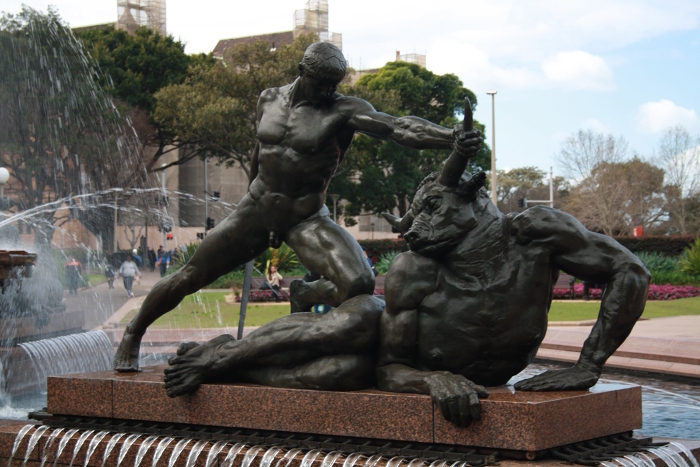 The figure grouping closest to the ANZAC Memorial is this, of Theseus killing the minotaur, and it provides a very strong contrast to Hoff’s works. Has the Memorial endured successful in its purpose? Spate (1999, p. 53) has suggested that the building’s “very perfection acts against its primary function: that of remembrance. It is perfect in the relentless logic of its architectual and sculptural symbolism, but it denies memory in that it allows the spectator no space for his or her experience. There is no gap in its dense web of cultural allusions that would allow one to make sense of one’s confusion of memories, emotions and knowledge about the ‘Great War'”. From my experience I don’t agree. Today at least half of the ground floor office area is an exhibition area, with changing displays of artifacts from conflict and peacekeeping work by Australians over the decades. There are ongoing special ceremonies, but on my recent visits most of the visitors were tourists. There are helpful guides, many of them ex-service. Beyond that for me there was space for contemplation and memory. The space is high – a secular cathedral. The exhibition is full of traces of individuals who fought, supported, waited… And at eleven o’clock each day, the Memorial and all within it remember. Minutes beforehand the staff – quietly, politely, firmly – speak to each visitor and invite them to participate. I was downstairs in the exhibition area. We stood and faced inward to The Sacrifice and in a brief ceremony we Remembered. In the end the architecture and the sculpture supported, but it was the people who made it a true Memorial. I went on my Western Australia holiday between my two visits to the ANZAC Memorial and would like to extend this Exercise with a brief comparison to the much more recent HMAS Sydney II Memorial by Charles Smith and Joan Walsh-Smith which I saw in Geraldton. 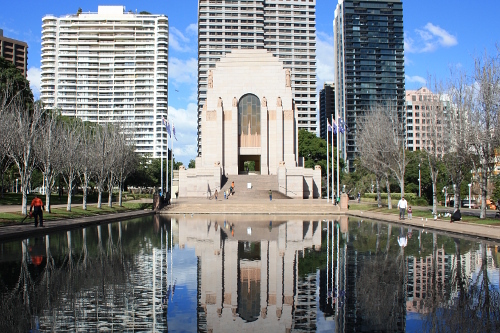 Writing about the ANZAC Memorial in Sydney I have focused on the interior – it was the subject of the Exercise of course, but also it is the centre of not just a building but of a landscape. 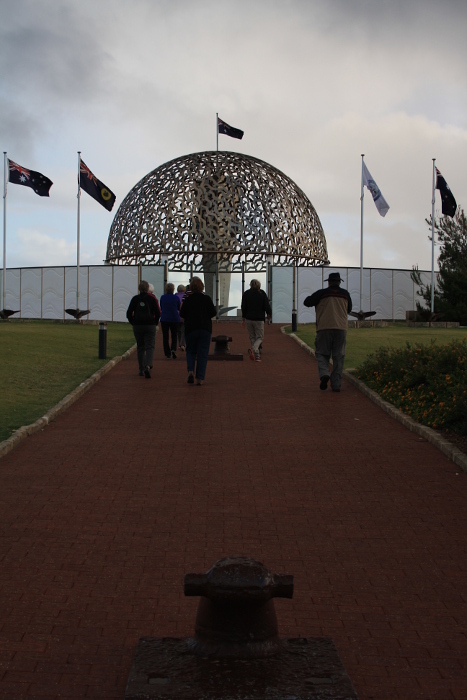 The HMAS Sydney II Memorial is not an interior, yet it felt very contained – I suppose an enclosed garden. It is however in a very specific place, overlooking the ocean where the HMAS Sydney fought its last battle in the Second World War. Both Memorials have Domes. In Sydney there are 120,000 stars, representing the men and women of New South Wales who enlisted in WWI. 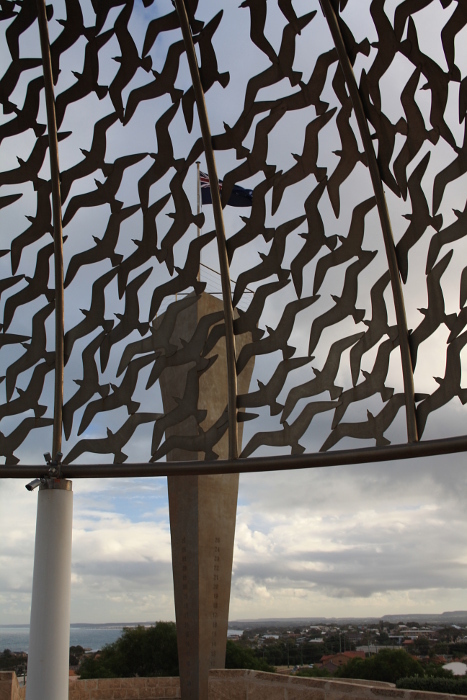 In Geraldton the Dome of Souls consists of 645 seagulls, representing each of the 645 sailors who lost their lives. Souls rising on wings are also referenced in Sydney, seen in the finials of the light fittings at the base of the Dome of Stars. The HMAS Sydney II memorial is very specific. It remembers a particular ship on a particular day, and the loss of 645 men whose names are engraved on the Wall of Remembrance that embraces, curves protectively around the site. After the wreck of the ship was found in 2008 a Pool of Remembrance was added. 644 gulls encircle the sunken pool. The 645th stands pointing the way to to the final resting place of the sailors. In contrast the ANZAC Memorial in Sydney is very deliberate in not naming the servicemen and women commemorated. The two Foundation Stones were set by “a solider” and “a civilian” – and this extends even to the plaque that records the memorial was opened by “a son of the King”. A final contrast is the representation of women. 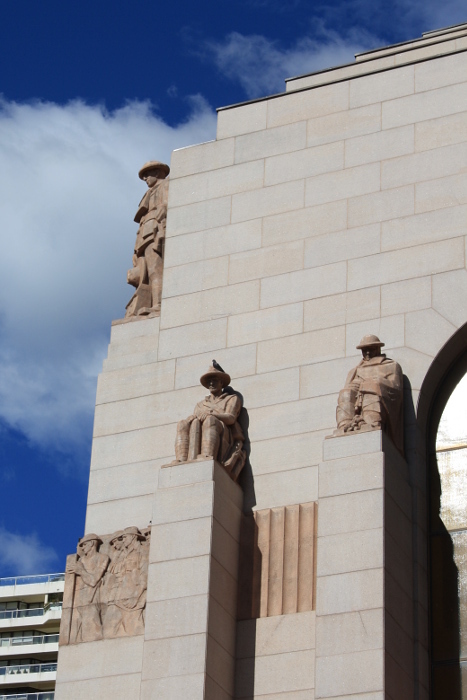 I’ve written above about the strong presence of women in the ANZAC Memorial. 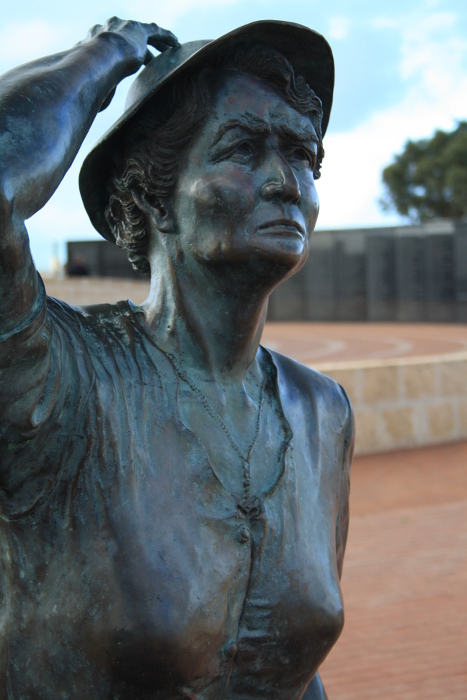 Only men served on HMAS Sydney II, but the one figurative sculpture included in the memorial is of a woman. This is the Waiting Woman, standing in the breeze on the headland, looking out for her loved one. As far as I have been able to discover the figure is not of any one person, despite the strongly individual features shown. When comparing to the ANZAC Memorial it felt to me that women had been restricted to a passive role. This is probably a reasonable interpretation of the specific focus of the Geraldton memorial, but it made me appreciate even more the progressive representation of the earlier work. http://www.anzacmemorial.nsw.gov.au/. As well as considerable information available on the website, guides at the Memorial were very helpful both in conversation and in providing me with printouts of additional information. 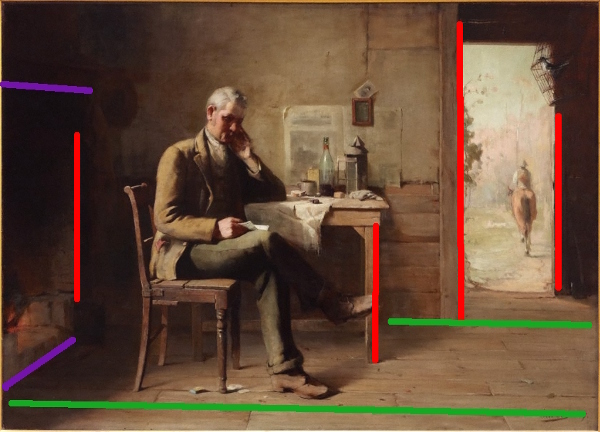 In this exercise we are asked to analyse a painting that has a window as a significant feature, and to consider some specific questions. I have chosen From a distant land (1889) by David Davies. 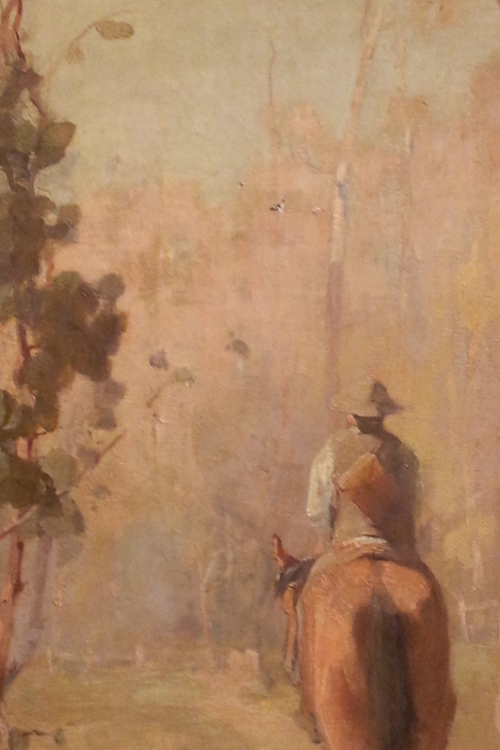 This narrative painting held at the Art Gallery of New South Wales (AGNSW) tells a classic Australian story. A settler, doing it tough, has received a letter from “home” and is lost in thoughts of another land, far from the hot, harsh bush seen through the door. My choice is based on availability of the work to view in person and my preference to give an Australian twist to this course. The picture presents the scene at a slight angle. 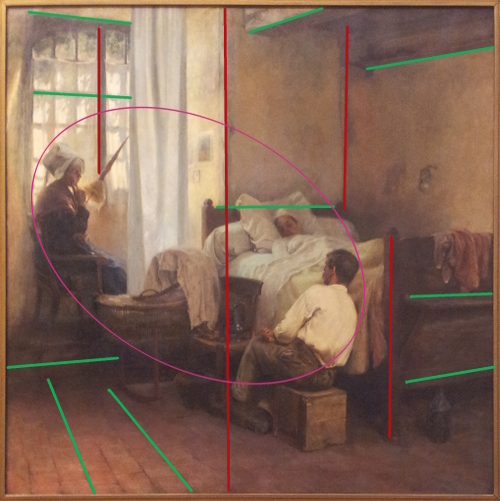 There are repeated verticals across the frame, indicated in the diagram in red, but nothing quite horizontal – the green lines showing the floorboards slope down to the right. The view seems to be from a corner, allowing us to see the dark, worn interior and also directly out the doorway to the brightly lit land. Combined with elements of linear perspective used in the fireplace, it may seem that the picture is slightly tipping out of its frame. This potential movement is countered by a series of opposing diagonals in the composition. 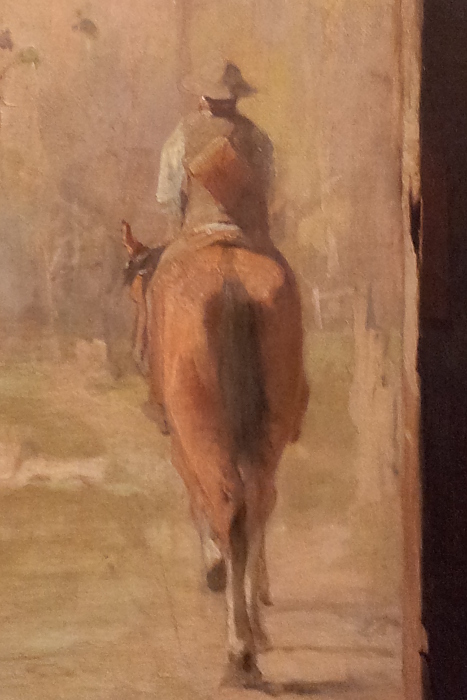 Lines in the figure’s body, the tilt of the bird-cage, the axe that can barely be discerned in the corner, even the movement of the departing horse and rider, work together to bring visual balance. The diagram above shows in light blue an extension of the lines of the fireplace. I don’t see this as a true vanishing point – the visual clues are both insufficient and inconsistent to provide this. However the lines do draw attention to an area of the wall that contains significant narrative information. The newspaper and photograph support the sense of a third location, the unseen distant land that is the title of the painting as well as presumably the source of the letter and the subject of the man’s reverie. The interior includes a lovely still-life on the table, laying bare the raw simplicity of this bush life. The figure’s boots are worn, the rough wooden floor uncovered. There are few comforts in this existence. The interior is generally in dull colours, tones of browns and greens with some touches of red and orange in the glow of the fire and skin tones. It has been described as “pure Gallery Tonalism” (Splatt and Burton, 1973, p.56). None of the lighting appears directly from the bright exterior. Instead the internal scene is lit from the high left front, augmented by some reflected firelight. The corner near the door is in very deep shadow, providing maximum contrast to the external view. This is not the only contrast. The colours of the exterior are higher in value and also in saturation. There are clear, bright yellows, pinks and blues. There is a sense of space, but trees and possibly a hill hide the distance. There is no use made of aerial perspective. Brushstrokes are more fluid and pronounced. It is “purely of the Heidleberg School” according to Splatt and Burton (1973, p. 56). There is a general feel of freedom and openness, for example the birds wheeling amongst the trees in contrast to the caged bird in the interior – the man’s only living companion in his lonely days of toil. Astbury (1985, p. 40) wrote of this painting: “The painting creates a mood of pervasive melancholy and quiet introspection … frugality and hardship of his existence. The continued influence of Folingsby and Longstaff’s winning picture is felt in the firmly drawn figure, the sombre interior and the melancholy sentiment.” This painting is a student work by Davies. From 1882 George Folingsby was art master at the National Gallery of Victoria Art School, and under his tutelage a repeated compositional device was “a darkened room a door opens out to the glaring sun of the Australian bush, allowing the interior narrative element to expand into the outside world” (Art Gallery of New South Wales, [n.d.]). Examples by other students include Home Again (1884) by Frederick McCubbin now in the National Gallery of Victoria (http://www.ngv.vic.gov.au/col/work/5970), John Longstaff’s Breaking the news (1887) in the Art Gallery of Western Australia (http://www.artgallery.wa.gov.au/exhibitions/everwondered_angus_bicycles.asp) and Flood sufferings (1890) by Aby Altson in the National Gallery of Victoria (http://www.ngv.vic.gov.au/col/work/6050). Judging from photographs of the other works, Davies’ focus painting shows more of the external world. This is of particular interest because it has allowed the artist to combine an academic style of painting in the interior with the artist-led “Heidleberg School” techniques. This movement is associated with “Australian Impressionism” and its use by Davies heightens the contrast – the conflict – of interior and exterior, and the sense that the seated figure is out of his element, in a land that is very foreign to him. He is yearning not for the world outside his door, but for the world he remembers thousands of miles away. Astbury, L. (1985) City bushmen: the Heidleberg School and the rural mythology Oxford: Oxford University Press. In this exercise we are asked to “research some of the ways in which trompe l’oeil has been exploited in works of art, particularly in decorative schemes”. “Trompe l’oeil” has been defined: “Term applied to a painting (or a detail of one) that is intended to deceive the spectator (if only briefly) into thinking that it is a real object rather than a two-dimensional representation of it” (Chilvers, 1990, p. 636 (2012 printing)). 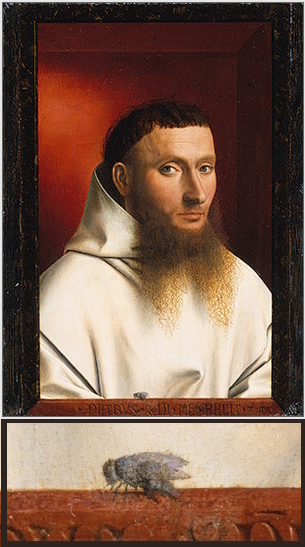 On the right is an example from 1446 – a fly apparently perches on the edge of the lower frame. It displays the skill of the artist, highlights the brief moment represented, perhaps serves as a symbol, momento mori, and presents the viewer with a momentary puzzle and surprise. However the artist has gone further. The lay brother is shown in a space, the corner of a room. It’s very hard to appreciate with modern eyes, but everything about the picture is presenting an illusion of three-dimensional space. In his later discussion Chilvers distinguishes trompe l’oeil from other “pictorial illusionism” such as quadratura. This he defines as ” as type of illusionistic decoration in which architectural elements are painted on wall and/or ceilings in such a way that they appear to be an extension of the real architecture of the room into an imaginary space” (Chilvers, 1990, p. 507 (2012 printing)). 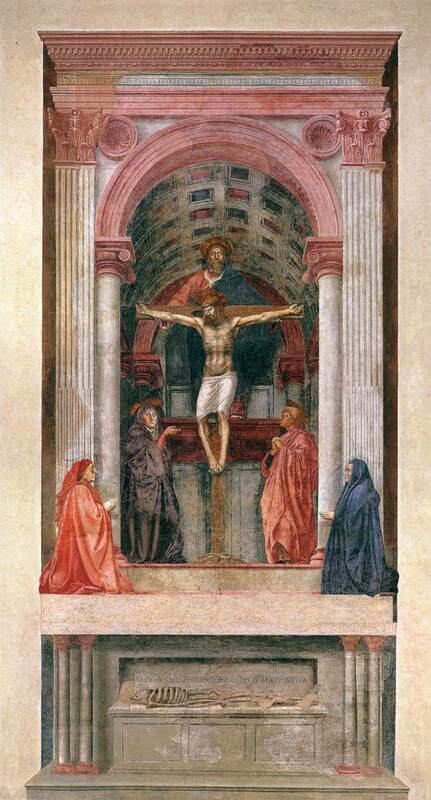 Masaccio’s fresco of the Holy Trinity includes amazing architectural features. It’s always dangerous to judge from photos, but the pilasters, attached columns and barrel vaulting of this image appear incredibly realistic, the tomb below projecting into the body of the church, the chapel opening out behind. Honour and Fleming (2009, pp 420-421) explain “with the aid of the new system of perspective Masaccio painted all the figures to scale and set them within a single unified space. … Two levels of reality, temporal and eternal, are … indicated”. painted ceiling in the Church of St. Ignazio. Masaccio’s work was created fairly soon after the re-discovery of linear perspective in the Renaissance. It is thought that he may have been advised or assisted in the work by Brunelleschi, a pioneer in the technique. Just over 160 years later, Pozzo’s amazing painted ceiling in the Church of SantIgnazio was created. In the photographs I find it virtually impossible to determine what is physical architectural detail and what is part of the extraordinary paintwork. This allegorical fresco celebrates the triumph of Catholicism in the Counter-Reformation, and in particular the contribution of the Jesuits. The vision of heaven is apparently only completely convincing from a single point given the complexity of lines of perspective and optical illusion, but such details are lost in reproductions (or possibly most photographs are either cropped or taken from that particular position). The heathen and heretics tumble, Europe’s natural supremacy over all other continents is presented as natural, inevitable, perhaps ordained by god. 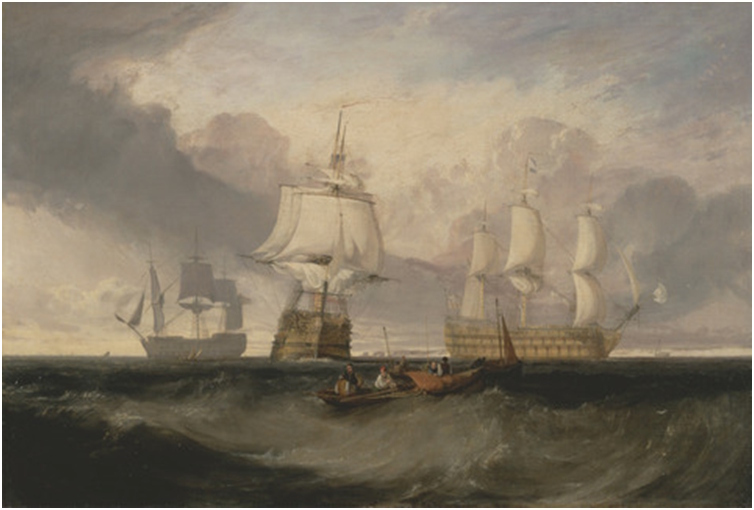 Discussing this work Honour and Fleming (2009, pp 576 – 577) explain the European attempt to impose order on the peoples discovered in the various voyages of discovery in the period. A classification system “which implied a process of social evolution from ‘savagery’ to civilization” was adopted supporting “the Christianization and commercial exploitation of the territory”. In this light it is interesting to view the interior of the Sacred Heart in Beagle Bay. I included an image of the interior when writing about my recent trip to Western Australia (see 26-Aug-2014). The traditional owners of this land are the Nyul Nyul people, and they call this area Ngarlum Burr. The European name was given in 1838, the first Catholic missionary arrived in 1885, French trappist monks in 1890, replaced by German Pollottine missionaries in 1900. The church was designed prior to 1908, and was based on a photograph of a German village church. It was built 1915 to 1918 when wartime restrictions were placed on the movements of the German priests and brothers. I believe some of the wall painting and decoration with different shells goes beyond simple decoration, providing a brief impression of a real object, in particular in the treatment of the thurible (hanging censer). Considered immediately after Pozzo’s work, it could seem possible that Sacred Heart church was another statement of the triumph over continents and peoples, imposing German architecture and christian beliefs, exploiting ‘savages’. Although very uncomfortable about our colonial history, I think that would be major distortion. The church remains the centre of an active parish. 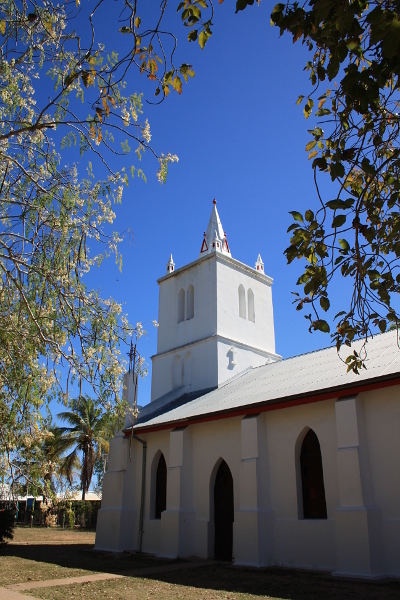 It “stands as a testimony to the generous work of generations of missionaries and Aboriginal people who have shared in the faith and aspirations of the Kimberley mission” (Kimberley Aviation, [n.d.]). 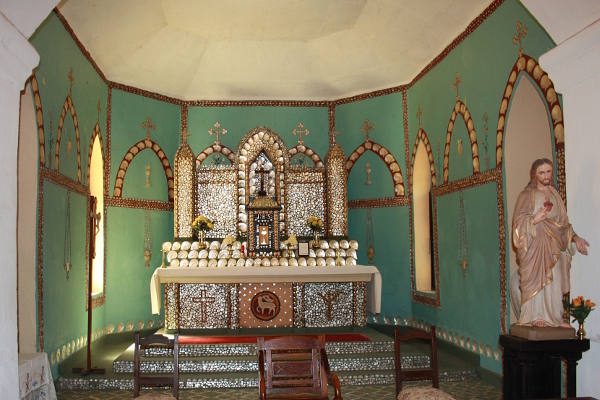 The decoration includes tribal symbols of the local peoples as well as christian symbols. The woman who led the Sisters of St John of God to Beagle Bay has been quoted: “Remember, the natives did not ask us to come. We are here of our own choice and can only remain by their goodwill and the grace of God” (O’Brien, 1907). After that side excursion I’ll finish with two more examples of trompe l’oiel – one all decoration, one quite different. 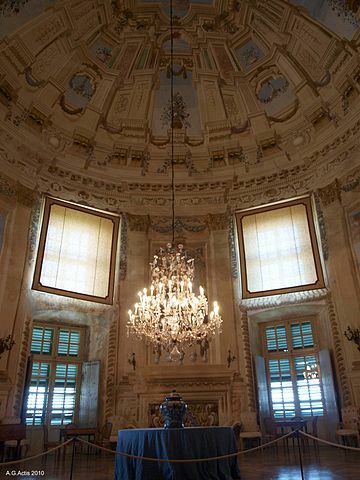 The first is extensive work in the Castello di Masino. The ballroom frescos date from around 1730 and provide colour, movement and interest in a rather sparsely furnished room (see http://www.friendsoffai.org/where-we-are_castello-di-masino.php for a limited amount of additional information). 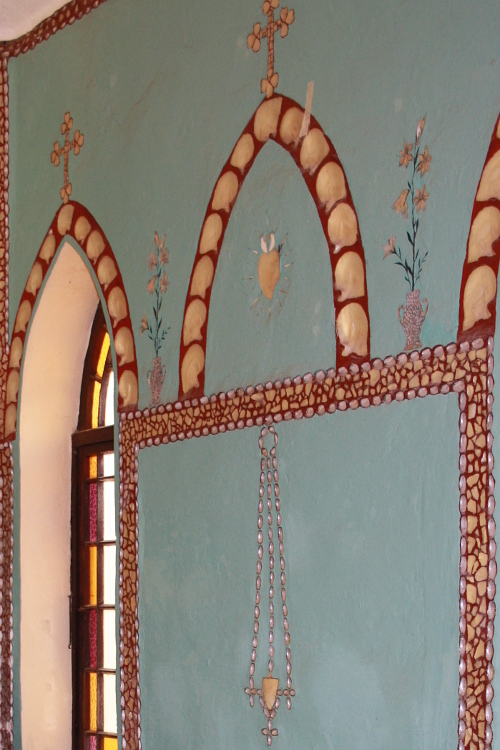 In the ballroom rows of windows, external landscapes and interior furnishings are all created in paint. The original fortress was destroyed in the sixteenth century, and the many frescos created in the seventeenth and eighteenth century. I would have like to learn more about this and the reasons for the frescos. They appear to be purely a rich and elaborate decoration, but the extent of the work seems unusual. Would it be a display of wealth, or would the painted rooms be a cheaper way of richly “furnishing” the castle? Finally Stephen Pong’s Broken Well, included in the current Archibald Prize exhibition. This three dimensional work is purely an exploration of optical illusion, with no decorative intent. The artist states “We perceive what we expect to see until our brain is confronted with conflicting information. This sculpture creates such conflict as a result of the interplay between the physics of light, reflection and inanimate objects. Mirrors were used to create an optical illusion of a dark, bottomless well. The brick wall perimeter was carefully constructed so as to merge seamlessly into the mirrored reflection. 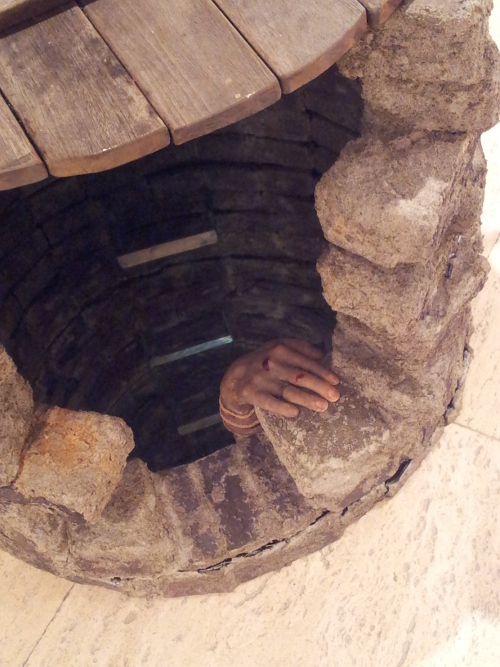 The gripping hand has been incorporated to represent a person hanging off the wall and about to meet an unknown fate akin to the struggles and outcomes encountered in one’s lifetime.” The work uses concealed lighting as well as mirrors and careful restriction of field of view to create a quite convincing illusion. Kimberley Aviation ([n.d.]) Sacred Heart Church Beagle Bay Information flier available at church. The Lacquer Room (1936) by Grace Cossington Smith (1892 – 1984) is the focus of my second annotation of an interior view. It’s a slight stretch to see this as “early twentieth-century”, but corresponds to the time-frames of the two suggested artists Matisse (1869 – 1954) and Dufy (1877 – 1953). The painting is on display at the Art Gallery of New South Wales (AGNSW) and is an example of exciting, vibrant, original, Australian art. Light, space and the relationship of figures to the setting are important elements in the painting of interiors, and I think this work provides an exceptional example of all. The image above from my phone’s camera has dulled all the colour, lost all the vibrancy and crispness of the original. The AGNSW website (link above) has a better but still not really good version. The picture shows the basement café of a major city department store. 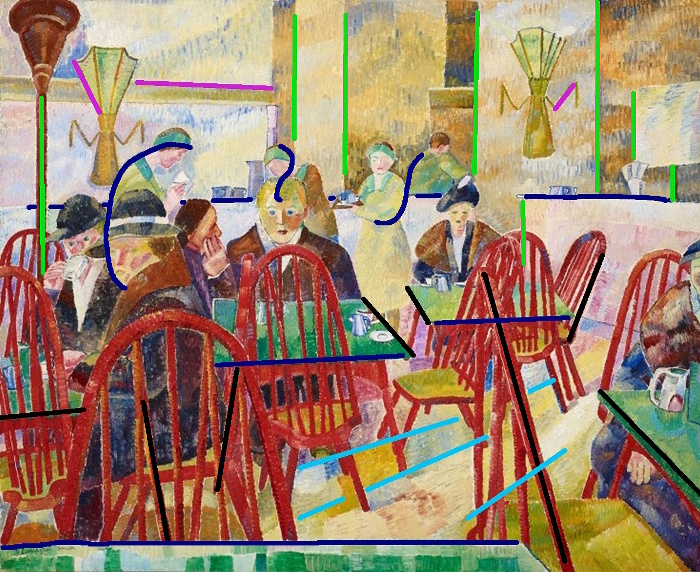 On the right is shown a sketch Cossington Smith made at the café, including notes of colours and materials (the sketch is held at the National Gallery of Australia (NGA) – see http://nga.gov.au/Exhibition/CossingtonSmith/Detail.cfm?IRN=133969). Light shimmers in this painting. 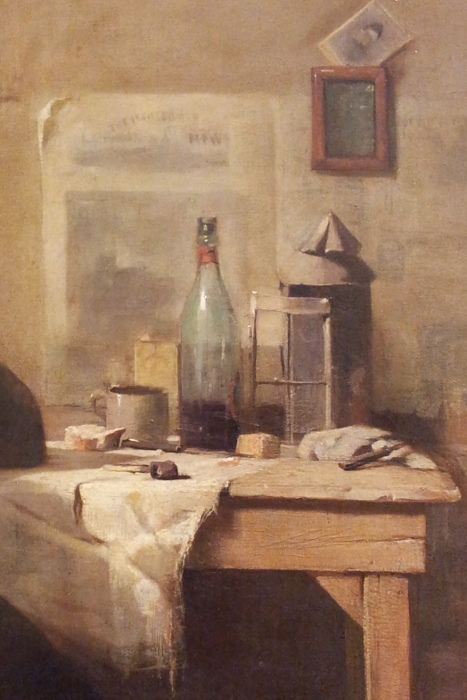 There are a few dark notes – shadow under tables, winter clothing – but most of the painting is in mid to high tones. The light has no obvious source. The wall-mounted Art Deco lights cast only a slightly increased light on the walls above them. The top of the free-standing lamp and the ceiling lights can’t even be seen. Instead an opalescent light suffuses the entire image, reflecting off surfaces to up-light faces. The light bounces around from the walls, floor, counter-sides, and mirror on the right. There’s so much light it is hard to believe this is a basement room (see a roughly contemporary photograph on the NGA site – http://nga.gov.au/Exhibition/cossingtonsmith/Default.cfm?MnuID=2&GalID=4). There is a darker bulk at the left of the image, women in dark hats and coats. This is cleverly balanced on the right by a truncated figure. Our eyes insert the additional weight. 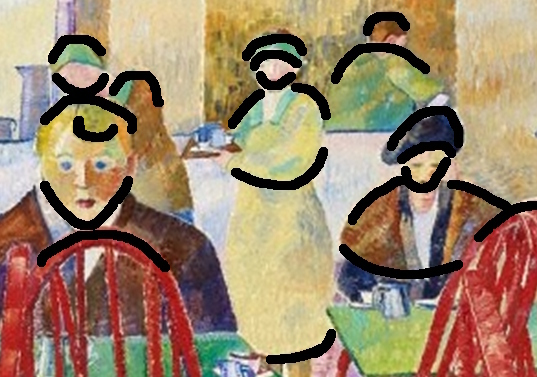 The lower part of the image is filled with curves repeating and echoing – chair backs, heads, bodies… The closer you look the more you see – hair, eyes, caps and saucers. There is a uniformity imposed that unites areas across the work. However that is only the beginning of the lines. Contrasting to the lower section, the top third of the picture is boxy, with vertical lines predominating (highlighted in green). Other lines (in pink) vary in direction, but remain straight, distinct, uncompromised. The two sections are divided by one long gentle curve of countertop from one side of the picture to the other. They are linked vertically by curves which run from one shape to another – a man’s hair parting to a woman’s jaw, for example. A few verticals also venture into the lower section – where lines run amok. The strongest are the red of the chair frames, with a strong band of dischordant near-verticals traversing the image. The edges of tables veer in slightly “off” directions. The floor heaves up to the right. The overall effect is busy, but strangely harmonious. This is a working room, a bustling café, and there is a sturdy sense of order in the momentary disarray. The picture is full of colour, particularly complementary colours. The immediately apparent colour contrast is red – green. At the bottom of the picture red chairs reflect in the green tabletop in a wide range of “reds” and “greens”, but blues with orange, yellows with purple are also well represented. The oscillation of the vibrating contrasts adds to the luminosity of the image. Little dabs of repeated colour – blues in a coat seen again in tiny shadows on chair backs for instance – help to contain and unify what could have become chaotic. Cossington Smith wrote of the genesis of this work “… I didn’t know it was there, but I just went down to get a cup of tea I think. And found this lovely restaurant. It was a great surprise to me. I was struck by its colour and general design … Scarlet, green and white held me spellbound. I quickly began drawing, writing the colours in words as I worked” (Cossington Smith, 1979). Colour was her inspiration. Writing colour names on her sketches was a standard part of her practice. Bruce James has suggested such notes “represented far more than a collective aide-mémoire. They constituted a chemical table via which the painter could conduct her polychromatic investigations into the dazzling Australian environments around her…” (2013, p. 34). James goes on to suggest that these notations were “so legible, so viable, so realisable” that the charting alone could be the full conception of the work, an early Sol leWitt. Cossington Smith used distinct short, aligned brushstrokes to create the painting. Generally colour-mixing was done on the palette, or optically in the eye of the viewer. This increases the shimmering effect of the contrasting colours. The modern, highly reflective nitrocellulose paints used in the café itself are captured in matte oil paint – “Light reflecting from the shiny surfaces is cleverly captured through broken swatches of colour” (Dredge, 2013, p. 118). The distinct brushstokes allowed the use of many colours without muddying, maintaining the bright, clean feel of the picture. The direction of the strokes provides some modelling of forms otherwise flattened in the patterning, and at the same time provide a unity and stability to the pulsation of light and colour. There is a definite sense of depth in the painting. In the centre the eye is funneled in, through an empty space between patrons and tables to a waitress, then on behind the counter to be stopped by the back of another worker. However on closer inspection the space makes no sense – it is flattened and distorted. Tables dip and bend, their sides twisted from perspective lines. 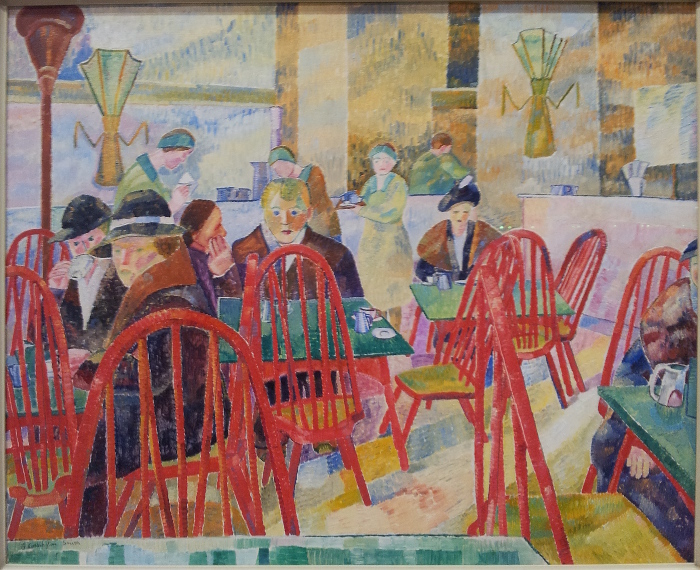 Just left of centre is the dominant figure of a man sitting behind a table – but where is woman who appears just to left of him? Is she sitting at the same table, but somehow just behind it as well? That seems to be her hand, but too large – or is the man possibly waving to us? In which case is the woman at another table further back? Behind this couple is one waitress apparently taking an order, and another possibly serving someone – but who, and how can there be space for them? Space is sacrificed to pattern, to pleasing rhythms and repetitions. This is an interior, but not one we can really enter. The various figures are firmly occupying their positions, especially those seated, but there is little relationship between them. Even those sitting at the same table do not interact. Most of those seated look out of the painting at us – or really at Cossington Smith in the act of sketching them. The café workers seem busy, solicitous to the needs of their customers – but which customers? None of those we can see. Faces are sketchy or not described at all, and one patron is cut off right through her face. This is a bright, modern, dynamic, urban scene. Although an introspective and solitary figure, Cossington Smith found urban scenes a source of energy and exuberance. The ‘Soda Fountain’ in the lower ground floor of David Jones was everything fresh, modern and exciting – art deco fixtures, American influences, an interior possibly designed by fellow artist Thea Proctor (McNeil, 2013, p. 98). While celebrating the material aspects of modern life, The Lacquer Room also suggests disquiet at the human impact – “… in this colour- and light-filled vision, the darkly dressed patrons who sit silent, mostly solitary and hardly welcoming in their cartoon glances, continue to express the artist’s ongoing reserve at the strangers the modern city makes of its inhabitants” (Edwards, 2013, p. 148). The Lacquer Room is a complete contrast to The first born by Gaston La Touche (see 19-Jul-2013). La Touche created his work to please the jurors of the Paris Salon. Cossington Smith had financial security allowing her to follow her own vision. La Touche created an idealised view of the life of the poor worker, Cossington Smith observed and celebrated her own environment. Colour and techniques are obviously entirely different, as are space (depth, flattening / patterning) and the relationships of the people within. La Touche explored morning light through the window while Cossington Smith suffused her work with modern electric lighting. I think the pair make a good introduction to the interior view in painting. Cossington Smith, G (1979) quoted in ‘Grace Cossington Smith: The Lacquer Room’, Australian Eye: series 2, video recording, Film Australia, Lindfield, NSW & Art Gallery of New South Wales. Producer Malcolm Otton. Director David Muir. This final part of the course begins with the interior – first as represented in paintings, then as an architectural space. 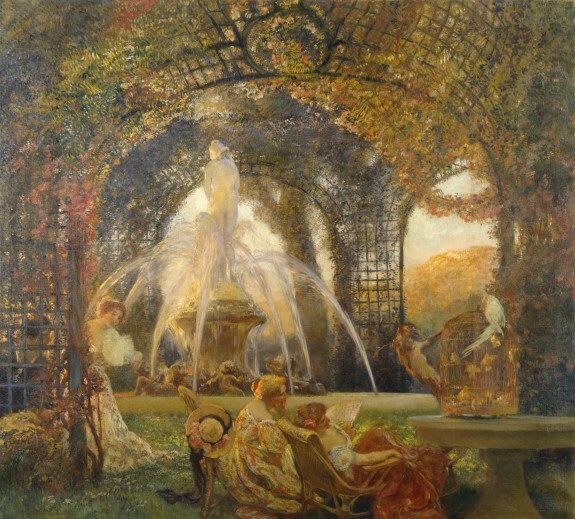 We are asked to annotate two interior views, and for my first I have chosen The first born by Gaston La Touche (1883) – an example of a nineteenth-century genre painting. The painting hangs in the Art Gallery of New South Wales (AGNSW), in my opinion was the best match to exercise requirements currently on display, and had personal appeal in the sense of light and the hint of a textile connection. This large, square picture was awarded a second class medal in the Paris Salon of 1888 and was purchased from the Salon for AGNSW. The painting shows a bedroom in a working-class home. A child, the first of the family, has been born and can almost be glimpsed in the straw-line cradle. The new mother sleeps, exhausted after what may have been a difficult birth. The young father sits on a rough wooden box at the foot of the bed, leaning wearily. An older woman, perhaps the grandmother, watches over the family as the light of a new day enters through the curtained windows. A series of strong verticals structure the image. A range of diagonal and nearly-horizontal lines, shown in green on the diagram, create the space of the interior. We are looking into a bedroom, perhaps standing in the doorway. The window is deeply set with a small platform, separated from the main room by a light curtain. The main elements of the image are contained in a smaller area, outlined in pink in the diagram. There are the three adults, the crib, and another presence – a religious image. Most of the light in the picture is entering through the large window, and it is beautifully dispersed by the sheer curtains. There may be some additional light assumed from the doorway, otherwise it is reflected light which brightens the back of the man’s shirt. 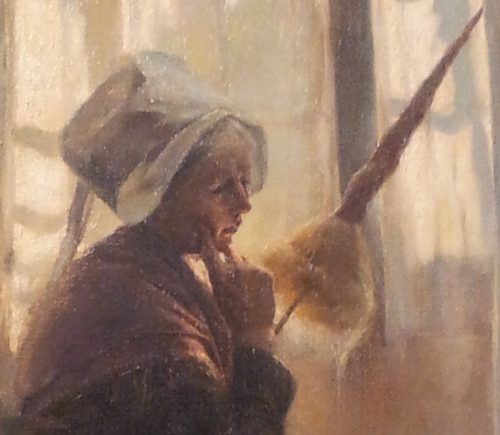 The light is particularly varied and beautiful around the head of the older woman – reflected from the curtains onto her face, gleaming through what I assume is flax on her distaff, highlighting the shaping of her cap. In addition a small beam of light reaches over the pillow to find the head of the sleeping mother. The colour palette is limited, mainly shades of yellow and brown, with touches of pink in the robe folder over the end of the bedstead and the shawl of the watching woman. There is a wide range of tones, with that bright white morning light touching each of the main figures, and contrasting dark shadows in other areas. Large areas of the image are left bare – texture on the walls and floor – which provides general interest while keeping focus on the main action of the image. 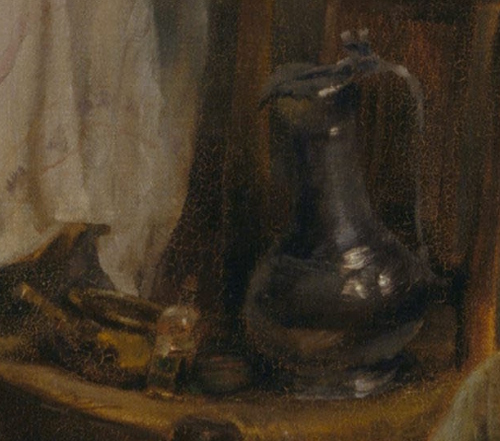 However there are also areas given careful attention, such as the still-life of jug and bottles on the rush chair seat, and the wooden box supporting the man. The general genre of narrative painting of interiors has its base in Dutch art of the seventeenth century, when the wealthy merchant class looked to spend their new wealth on works of art to adorn their homes. Such paintings would be small, suited to the domestic scale, detailed, and show a familiar rather than mythological or religious scene, often with a moral message. Most of those criteria apply to The first born except for the scale. This is a large work, designed as an entry to the Salon. The picture was well received in that environment, a report from that time including “Each actor of this familiar scene is exhibited in the simplest, truest and most impressive attitude, and the light, sifted through the large curtains, enters soft and clear into the humble dwelling, filling its naked walls with a pleasant, subdued radiance. Nothing is abandoned to purr sentimentality, but yet a chastened tenderness seems to be diffused throughout the chamber. M. la Touche has here produced a powerful and exquisite work” (Gazette des Beaux Arts, 1888). Despite this measure of success, La Touche did not continue with such themes for many more years. He destroyed many of his early work, and in 1891 “consigned fifteen years work to the flames of a bonfire in a single day” (Brindley & Maclennan, [n.d.]). Presumably the AGNSW work was saved by its sale and voyage to Australia. The Walters Art Museum suggests “As a mature artist, [La Touche] broke with his realist beginnings to paint in a harmonious decorative style that reflects the influence of the Rococo painters of the 18th century” (The Walters Art Museum, [n.d.]). From the web image it’s certainly difficult to reconcile the two paintings from the same hand. Another work, Pardon in Brittany (1896) in the Art Institute Chicago (http://www.artic.edu/aic/collections/artwork/111656?search_no=7&index=9), while apparently using a broader palette and quite different technique, shows a handling of light much more in keeping with his earlier work. 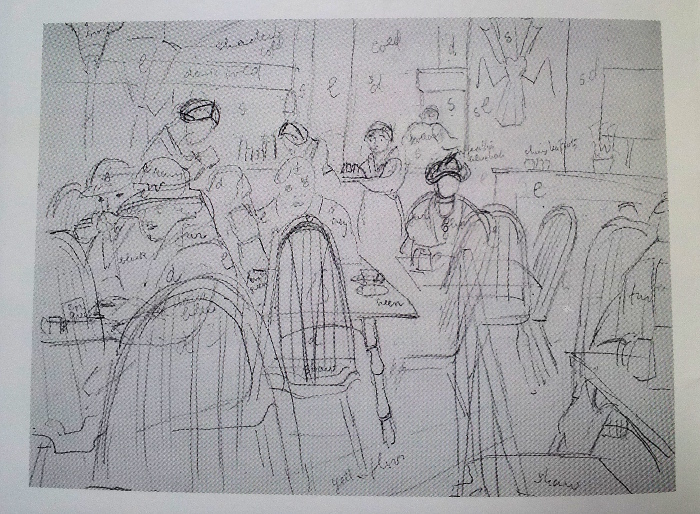 La Touche was part of the Paris art cafe scene and received advice from Manet and in particular Felix Bracquemond. It is interesting to see a basically classic, academic (although not academically trained) artist producing “vigorous, harsh and somber” works (Turner, 1996?) modify his work to such an extent. Turner, J. (1996?) The Dictionary of Art Vol. 18, p. 835. Photocopy sighted in Research Library, Art Gallery of New South Wales.